One slide from Unilever Plc’s first half results presentation says it all. Quarterly sales growth since March 2008 is shown in two separate charts, one for volume and the other for price-led growth. The volume bars have been going down steadily, even turning negative for two quarters. In contrast, the price bars have been going up steadily, till the management took corrective action in the March 2009 quarter. Unilever’s priorities across geographies in 2009 are to restore volume growth and protect its cash flows and margins. Understandably, developing and emerging markets such as India are a key focus area. One of several initiatives being rolled out is the 30-day action plan, which instils a sense of urgency among employees to remedy situations. The idea is to have an action plan that can be shown to work in a short period of time. If this had been in place a year ago, it could have ensured that the first signs of a decline in volume growth were given more attention. HUL has been losing market share in its key categories. 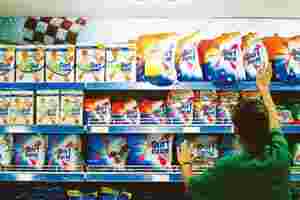 In the June 2009 quarter, the market share in detergents dropped to 36.2% from 39.1% a year ago, in soaps from 52.1% to 46.3% and in shampoos from 46.5% to 45.4%, according to company data. The consumer goods market saw buyers trading down to cheaper products while large retail chains lowered their stock levels in response to the economic slowdown. HUL’s response has been to lower prices or give more volume at the same price, free offers and have products across price points in its key categories. Supporting this is a cost efficiency programme that will limit the impact on margins, even as its steps up advertising to support its brands. That’s why its PBIT (profit before interest and tax) margins improved by 60 basis points in the June 2009 quarter, despite higher ad spends and lower price-led growth. One basis point is one-hundredth of a percentage point. Lower commodity costs will help in protecting its margins, especially in the second half of 2009-10. These efforts will take time to show up in its performance. But the first positive signs to be looked for are a return to decent volume growth (but the drought could affect that) and a gain in market share. These are visible for the moment in some of its new product segments. But gains at the overall level will be what investors will be looking for. HUL’s share price is down 2.3% from its level a month ago.